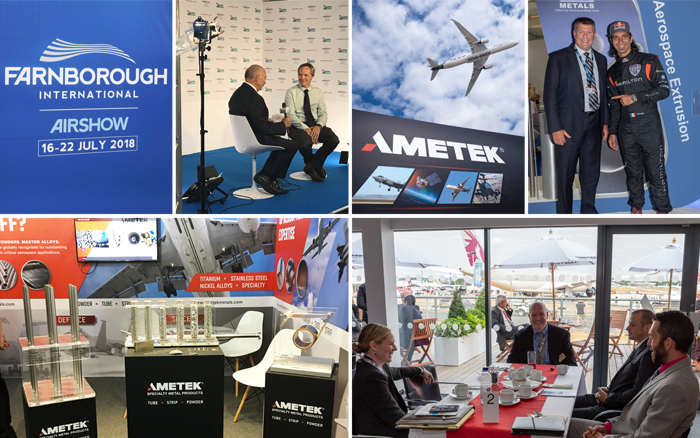 For the first time, AMETEK SMP presented its four key brands - Reading Alloys, Fine Tubes, Superior Tube and Hamilton Precision Metals - at this year’s Farnborough International Airshow. SMP also managed to exceed the expectations of the lucky prize draw winner Kirk Moore, President and CEO of TW Metals. At one of the upcoming Red Bull Air Races he will have the chance to take part in an adrenalin-pumping G-flight experience with one of the Red Bull Air Race pilots. Dario Costa, Red Bull Air Race Challenger Class pilot drew the winner and personally delivered the good news. While hosting the first Red Bull Air Race demo to be held at the 2018 Farnborough International, Airshow visitors were treated to the spectacle of Dario Costa reaching speeds of 370km/h and enduring forces of up to 12G as he flew his Edge 540 racing plane around a low-level course marked by the famous 25 metre-high, air-filled pylons.